Rodgers was not Bowie’s original choice for the album, as he planned to once again use producer Tony Visconti as he had on the previous five studio albums (including the three listed above). However, Bowie suddenly switched to Rodgers and Visconti was not informed until two weeks into the recording process for Let’s Dance. 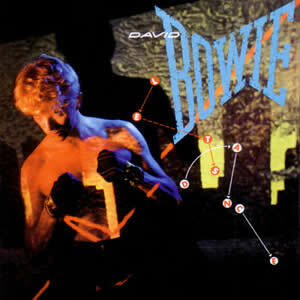 Bowie also used the album and its subsequent MTV videos to reinvent his image for the 1980s. Having just signed a big deal with EMI Records, Bowie and Rodgers worked to produce a commercially viable album that fused the popular sub-genres of party-funk with the “big drum” eighties dance with just enough Avant Garde edge to keep it interesting. The album is also notable as one of the earlist recordings for blues guitar virtuoso Stevie Ray Vaughan, who met Bowie at the 1982 Montreux Jazz Festival and agreed to play on the project despite admitting to being unfamiliar with much of Bowie’s music. However, Vaughan was impressed with Bowie’s knowledge of funky Texas blues and the two talked for hours on the subject. Let’s Dance comes tearing out of the gate with “Modern Love”, about as upbeat and effervescent rocker by David Bowie as you will find in his vast catalog. The track starts with a unique, deadened-guitar sound, which quickly blends with the strong and consistent drum beat by Tony Thompson, who provides this quality throughout the album. Bowie has claimed the song is inspired by Little Richard, and he uses a “rock voice” which almost to the point of being strained. The third single released from the album, “Modern Love” peaked at #2 in the UK while hitting the Top 20 in America. “China Girl” is a reinterpreted version of a song Bowie wrote for Iggy Pop on that artist’s 1977 album The Idiot. An almost deceptive track, which morphs from a light and poppy tune into something much deeper (even darker) during the bridges with ever-odd sections that build the tension until returning to the original chorus. This song (which also peaked at #2 in the UK) contains a strong bass riff by Carmine Rojas along with bright guitar chords beneath the soft and directed vocals by Bowie. “Let’s Dance” is David Bowie’s fastest ever selling single, reaching the top of the charts. Released ahead of the album by the same name, the song set the pace for the great commercial success Bowie enjoyed in 1983. It is built on a moderate but methodical bass line with Bowie using yet another style of singing voice above a perfect dance drumbeat. There are some great extended middle parts, which go ludicrously far near in hammering home the brittle funk intent of the song and album, as well as Bowie’s latest image transformation. The fine original first side of the album concludes with “Without You”. A bit off-beat, yet still very refined, this song is almost like soft version of disco with its high-register vocals, strong bass presence, slight female backing vocals, and just a touch of funky guitar overlay. However, Let’s Dance is a very uneven record, as the second side sounds like a much cheaper version of the first. “Ricochet” seems to try a bit too hard to get the off-beat syncopation and the result is a song which sounds forced, especially with the elongated arrangement and overuse of spoken voice effect. “Criminal World” is a remake of a track by the glam rock group Metro and employs some eighties production techniques and arrangements. “Cat People (Putting Out Fire)” is a bit more intense but still kind of standard track, with the only real highlight being Vaughan’s lead guitar. The closer “Shake It”, returns to the very funky dance formula (almost an alternate version of “Let’s Dance”) which, if nothing else, solidifies Rodgers influence on this album. Let’s Dance peaked at #4 and actually Bowie’s first-ever Platinum-selling album, although later sales of earlier albums surpassed that feat. The surprise commercial success of the album proved to be a double-edged sword – it did introduce a whole new generation to the artist but also initiated a prolonged artistic “slump” starting with the disappointing follow-up Tonight a year later, and lasting the better part of a decade.